Underwood Animal Hospitals have been serving the Licking County area since 1982. We understand that your pet is a valued member of your family. 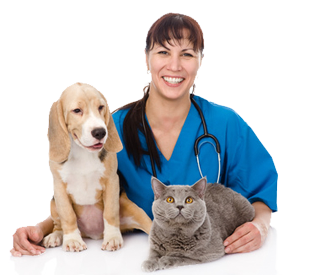 Choosing veterinarian care for your pet is an important decision. Contact us today to schedule your pets appointment. Our trained professional staff will care for your pets in a kind and gentle manner. Since I have not adhered to a seasonal update very well, I have chosen the year this time. What can you expect in 2017? More is happening in large animal veterinary medicine but some changes may seep over into pet animal practice. A new federal regulation called “The Veterinary Feed Directive” now requires a licensed veterinarian to supply a form indicating the need for drugs that have been sold by feed stores in the past. I am expecting that this will not be welcomed by farmers. Involving a veterinarian for what have been considered feed additives in the past will increase cost and effort involved. It may also reduce the use of many antibiotics added to animal feed. I believe that is the intention of the Food and Drug Administration since the primary motivation for any changes regarding the use of antibiotics is the steady increase of drug resistant bacteria affecting the human population. An increase in oversight of animal feed additives may reduce unnecessary exposure of bacteria to antibiotics and the resultant development of resistance to some of those antibiotics. Food animal veterinarians will be well versed in the requirements but the occasional hobby farmer may ask their pet animal practitioner for help. Even bee keepers may need veterinary authorization for antibiotics commonly available in the past. I recommend letting the veterinarians dealing with food producing livestock handle these changes. From what I have learned so far the requirements are vague at best. If you have livestock or are a beekeeper you should develop a relationship with a food animal veterinarian if you do not already have one. What is happing on the pet frontier? Every conference I attend has more lectures relating to the use of therapy lasers on dogs and cats. Therapy Lasers have been improved upon and now are in the forefront of new treatments for old diseases. Their popularity and uses are an explosion in the veterinary community. Very few conditions do not benefit from treatment with a Therapy Laser. The concentrated light beams of specific wavelengths penetrate injured and arthritic tissue and speed or induce healing beyond a pet’s natural ability. We have been happily surprised at some of the effects our Therapy Laser has produced. Our successes have included not only arthritis but also bladder infections and wound healing. New uses appear in the literature regularly. Our Therapy Laser is located at the 21st Street Office but our Heath patients also can easily be scheduled to receive treatments if needed. Any stubborn problem delaying recovery and the return to a happy active pet should receive the benefits of Laser Therapy. It is quick and painless and well accepted by pets in our experience. The wild swings in temperatures we are experiencing can stress pets leading to infections and also revives allergies that usually become dormant during the cold winter months. Be on the lookout for conditions not usually seen in the winter. My dog Roodie has ear allergies that have flared up every time the weather hits a warm spell. I generally can stop his Apoquel itch medication in the winter but that has not been the case this year. Good health to you and your pets and please call our offices with any questions.